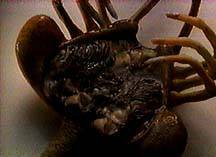 The Facehugger phase of the Xenomorph life cycle is a creature that has been likened to a hybrid of a crab and spider. It appears to be comprised of an abdomen, legs, and tail with no visible head or sensory organs. The creature is approximately 1.55 meters in length (including the tail), with a long retractable tube-like mechanism extruding from the mouth, that can extend to an approximate length of .5 to .75 meters. An aggressive physical assualt method seems to be what the Facehugger is best suited for when it comes to attacking and subduing a potential host. 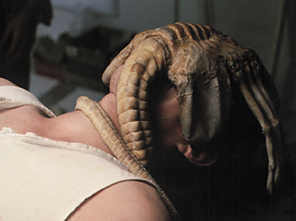 In this assault the Facehugger is usually still inside the egg when the potential host "discovers" it. The extremely powerful tail that is coiled beneath the parasite is used as a spring to launch the creature from the confines of the egg and toward the potential host. The Xenomorph's expulsion from the egg is so violent and aggressive that the attack is often times overwhelming - in the sense that the victim has little to no time to react to the attack, and is usually subdued within seconds. However, should initial contact with a host fail the Facehugger then relies on its legs as a very effective means of locomotion. This creature can react with astonishing agility and speed once on open ground. It has also exhibited a certain degree of stealth while stalking mobile victims so as to gain the upper-hand and potentially catch the prey off-guard. As with its adult counterpart - it seems to have infinite patience. It has also shown the ability to climb: while on board the U.S.C.S.S. Nostromo it climbed into the overhead structures of the Med-Lab after implantation was complete, and on LV-426 it used the overhead structures in of the Med-Lab to "pounce" on Lieutenant Ripley. 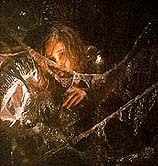 During an instance where the potential host is either cocooned into the Xenomorph hive walls, or is in some other way incapacitated, the Facehugger has been recorded crawling from the egg, as opposed to leaping from the egg. In this means of acquiring a host the Facehugger actually takes on the characteristics of a passive creature: it's actions are slower, and seem to be executed with a certain degree of care - as if to avoid harming the potential host. 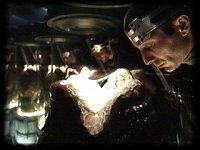 The means by which the Facehugger locates its victim are believed to be the identical to the means by which the adult Alien acquires a potentual host: a combination of heat, smell, sound, and vibration. However, it has not been established where the Facehugger's sense organs are located. 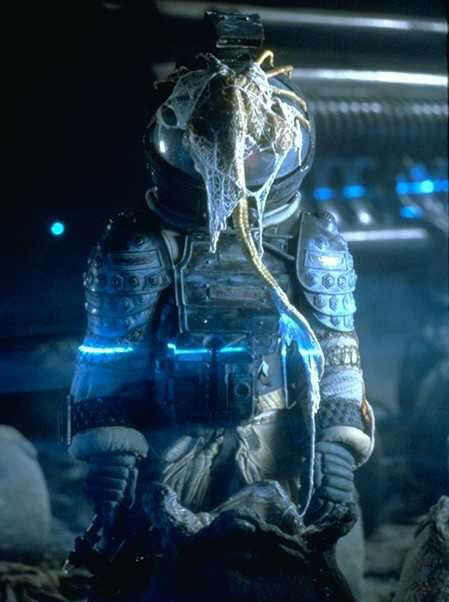 Speculatively, within the hive, the Facehugger may be responding to a pheromone trace that has been excreted by the adult Xenomorph responsible for the cocooning of the host. Such a pheromone trace would serve a duel purpose: to be used as a means of locating the host when returning with an egg from the egg chamber (employed by an adult Xenomorph), and to act as a "beacon" for the Facehugger once the egg is open. This would account for the larva's apparent "nonchalance" in settling on a host so as to begin the process of depositing the embryo. 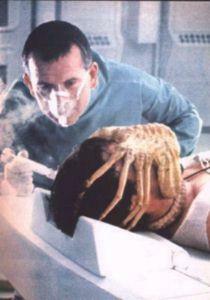 After depositing the Alien embryo, the facehugger departs from the host, generally dying within a short distance. All Alien, Aliens, Alien3, Alien: Resurrection materials are Copyright © Twentieth Century Fox Film Corporation. These pages are unofficial, non-profit, and intended for film commentary and criticism purposes only. No trademark or copyright infringement intended. In addition, I have used numerous photos and text from other fan sites. If any individual finds text they have created and would prefer if it be removed from this Website, I'll gladly remove it. Thank you again!! !